Mufasa the mountain lion lived for 20 years chained in the back of a pick-up truck amongst rusting circus equipment. Despite Peru’s ban on wild animals in circuses, there seemed little hope for Mufasa as the circus went undetected, on the run, moving between remote villages. Then in a dramatic raid earlier this year, wildlife officials and Animal Defenders International rescued the elderly cat, who is believed to be the last wild animal in a Peruvian circus. ADI President Jan Creamer who led the rescue team in Peru said, "It was heartbreaking to see Mufasa chained among the circus equipment, living on the back of a pickup truck. A heavy harness and chains were wrapped around his body and as we cut them away, he stretched, free, for the first time." "It is magical to see him moving about in and out of the trees in his own piece of protected forest. Mufasa was torn from the wild and has endured the worst possible life and will need special care so I hope people will help us give him a wonderful retirement by making a donation to ADI today." 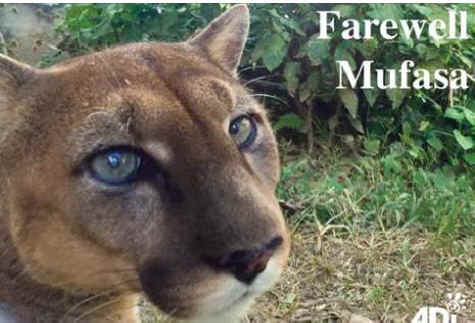 We are sorry to bring the sad news that Mufasa the mountain lion has passed away, after a few months of freedom after being rescued from the circus. 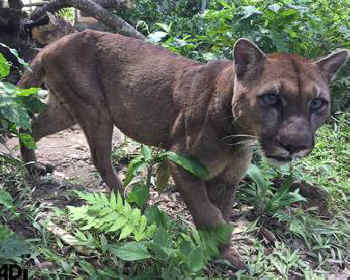 20-year-old Mufasa’s life being chained to the back of a pick-up truck had damaged his health and he was suffering with kidney failure and other age-related problems. He was a beautiful, gentle, friendly animal who really enjoyed a back scratch. We are so sad he did not enjoy more time in his forest habitat in the Amazon, but the real tragedy would have been if he had never experienced that freedom at all. We will always remember him walking undergrowth and climbing on his platform to sleep and enjoying peace, love and respect from the people caring for him. This time with him was precious beyond belief, and we are comforted that Mufasa got to go home. Our thanks to everyone who made it possible.